The former Minneapolis Public Schools Headquarters, rebranded as the Highlight Center, was opened to the public this week with a design reflective of its art-loving neighbors in Northeast Minneapolis. Hillcrest Development is celebrating a successful rehabilitation -- and leasing -- of the century-old structure exactly one year after purchasing the derelict property. 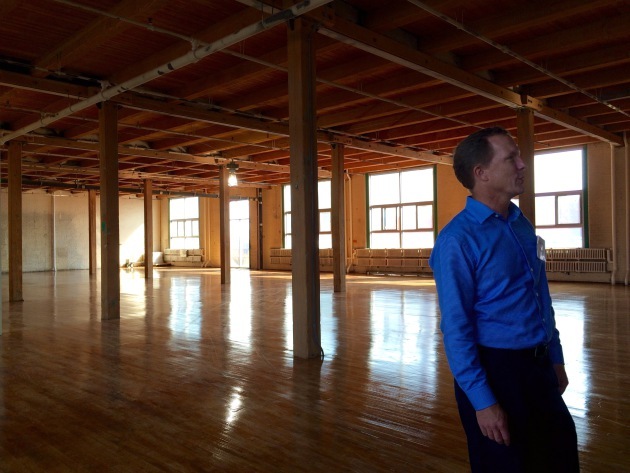 The Minneapolis-based developer has turned the troubled building into a multitenant office space with a focus on tech and creative firms. The brick and timber structure at 807 Broadway has a new green roof garden, stormwater detention and filtration system under the parking lot, energy-efficient windows, a composting site and reclaimed floors. About 60 percent of the 150,000 square feet of rentable space is leased and an additional 25 percent is pending. Sport Ngin, a developer of software for sports leagues, is the building's largest occupant with 32,000 square feet of sundrenched space on the third floor. Hillcrest's managing partner Scott Tankenoff gave credit to the neighborhood's 807 Broadway Task Force for pushing the city on getting a commercial use into the site. "The task force really didn't want a housing project. They wanted something that created jobs and was a great value to the community," Tankenoff said. Originally built around 1914 as a lightbulb factory, the site had considerable environmental problems. "Contamination and redevelopment seem to go hand-in-hand," Tankenoff said. The Minnesota Department of Employment and Economic Development kicked in nearly $200,000 for demolition costs and stormwater management and the Metropolitan Council awarded more than $575,000 for hazardous material abatement. Also on the 5.8-acre site is the soon-to-open Able Seedhouse and Brewery. Founder Casey Holley was onsite Tuesday in the 10,000-square-foot building across the parking lot from the office complex. Large glass-and-steel garage doors were rolled up as crews worked on the HVAC system in Able's warehouse-like space. Holley and his three business partners have a vision for locally sourced small grains to be incorporated into their beer, which will be brewed by Bobby Blasey, formerly of Mankato Brewery. For the last three years they've developed relationships with three Minnesota farmers and one Wisconsin farmer that will sell wheat, barley and rye to Able. Able Seedhouse and Brewery founder Casey Holley in the soon-to-be-completed new space. "Hops are the glamor in beer right now, but the small grains are the heart and soul of beer. And we are great at growing those here in Minnesota," Holley said. "If we can get 5 percent of a local wheat malt or barley malt into our beer, we're really doing something special. And, then, we can hopefully scale up from there." Holley hopes the brewery will be ready to open by late October.